Anglicans in Southern Africa have been invited to join Thy Kingdom Come, a global prayer movement which invites Christians around the world to pray between Ascension and Pentecost (from May 10 to 20, 2018) for the empowerment of the Holy Spirit, so that we may become effective witnesses and that many more people will come to know Jesus Christ. The movement began in the Church of England, when the Archbishops of Canterbury and York invited Anglicans in England to join in prayer. 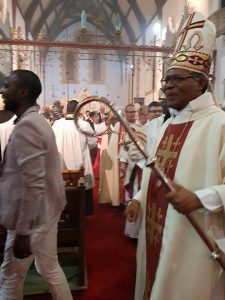 At the opening of his Charge to Synod last night, Bishop Bethlehem announced that the Synod of Bishops have released him to retire on 31 July 2018. He thanked God for the privilege of having been given the ministry of a Bishop but cautioned, “For those who may be filled with ambition for the office of the Bishop let me caution you: Study I Timothy 3:1-7, you will do well. The remainder of the report can be found on the Diocese’s Facebook page.